This is my favorite method for roasting a chicken. The key is to salt ahead of time. Two to three hours ahead of time is great; one to two days is even better. A good rule of thumb: use 1 teaspoon kosher salt (I use Diamond Crystal) per pound of chicken. I store the salted chicken in the fridge in a 4-qt Pyrex bowl that has a lid. When I’m ready to roast, I’ll try to pull the chicken out an hour beforehand, and I pat it very dry with paper towels. One chicken, 3 to 4 lbs. A day before (or at least 2 to 3 hours before) you plan on roasting the chicken place it in a large bowl (4-qt or so). Season it all over with kosher salt using about 1 teaspoon for every pound of meat. Cover the bowl and stick it in the fridge. Remove bowl from fridge an hour (if possible) before you plan on roasting the chicken. Preheat the oven to 475°F. Choose a shallow oven-safe skillet. Preheat the pan over medium heat for about five minutes. Wipe the chicken dry (very dry!). Season all over with pepper if you wish. Set it breast side up in the pan. It should sizzle. Place the chicken in the pan in the center of the oven for 25 minutes. 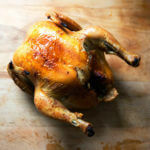 Turn the bird over — drying the bird and preheating the pan should keep the skin from sticking. Roast for another 10 minutes, then flip back over to re-crisp the breast skin, another 5 to 10 minutes. If you have an instant-read thermometer, it should register about 165ºF. Remove the chicken from the oven and turn off the heat. Lift the chicken from the roasting pan and set on a plate. Add about a tablespoon or two of water to the hot pan and swirl it. Slash the stretched skin between the thighs and breasts of the chicken, then tilt the bird and plate over the roasting pan to drain the juice into the drippings. Add a pad (a tablespoon or so) of butter to the pan, if you wish. Using a wooden spoon, scrape up any chicken bits stuck to the pan. Taste the sauce. Add a squeeze of lemon if you wish. Let the chicken rest 15 minutes before carving it. Serve with the sauce on the side. To make a stock with the carcass, remove any remaining meat from the bones. Be sure to really get into the breast and backbone and extract any meat. Save this meat for a salad or soup. Place all of the bones in a 4-qt pot and cover with water. Simmer slowly for about 2 to 3 hours. Strain into a bowl. Transfer stock to quart containers and store in the fridge for a week or the freezer for up to 6 months. You should have about 1.5 to 2 quarts of stock.